Two Doctors Encourage Native American Women to VBAC! Here is another response to the statement dated December 2007 from Hastings Indian Medical Center explaining why they no longer offer VBAC. Wow is this article amazing for being published in the post-2004 “anti-VBAC per ACOG” era, by two MDs no less? If your OB gives you the third degree about VBAC, you might want to give him a copy of this article. The tide against VBAC might be turning! found VBAC success can be had among women with “larger babies” (over 4000 grams or 8 lb, 12 oz) (62%) and women who are ‘overdue’ as defined as 41 weeks or more (64.8%). I would personally take these odds over the 0% chance of VBAC success if you have a scheduled repeat cesarean! Maybe the pendulum is finally swinging the other way and this will be the beginning of VBAC support for all women. The emphasis below is mine. Note that VBAC is referred to as ‘trial of labor after cesarean’ or TOLAC. We appreciate the willingness to engage in discussion about trial of labor after cesarean (TOLAC) availability and the approach to cesarean delivery at W. W. Hastings Hospital. Every facility faces unique factors in the decision to offer TOLAC services. However, we fear that the high total cesarean rate and lack of TOLAC services will ultimately result in worse perinatal outcomes considered from a population level. Not only is vaginal birth after cesarean (VBAC) highly desired by many women, but it is preferable to a repeat cesarean delivery in certain women, including those with a single cesarean delivery who have had a successful vaginal birth before or after their cesarean delivery. Evidence suggests that such women should be encouraged to have a TOLAC particularly if they plan to have additional children. Given these data, anesthesia staff should be strongly encouraged to change their policy and offer 1 VBAC services in accordance with guidelines similar to those developed in the Northern New England Perinatal Quality Improvement Network (NNEPQIN). Ethically, it is difficult to justify withholding TOLAC when it is the safest option. If services were offered to this group of women, obstetrical and anesthesia staff could develop greater comfort with TOLAC and expand the local eligibility criteria. Annual cesarean rates at some Indian Health facilities in Oklahoma are > 37% and short term rates over 40%, hence are above the recently published 2006 national rates for the total U.S population (31.1%), the Oklahoma state population (33.3%), and the US Native American population (27.5%) 2 We note that the Native American cesarean rate increased 1.5% from 2005 to 2006, almost double the 0.8% increase for the total US population. The rising cesarean rate is likely a reflection of both rising primary cesarean delivery rates and decreased vaginal birth after cesarean delivery. Given the limited availability of TOLAC services for women in the Oklahoma service area, efforts should be made to minimize the primary cesarean delivery rate. The decision to lower the threshold for primary cesarean delivery as evidenced by an acceptance of the high rate and an unwillingness to look at physician specific factors will result in higher adverse outcomes in future pregnancies 3, particularly when combined with the lack of TOLAC services. Women in the Hastings area with primary cesareans can be anticipated to have cesareans in all future births placing them at increased risk for placenta accreta, increta and percreta 5. These complications of abnormal placentation may be particularly difficult to address in a rural community hospital setting. Although Healthy People 2010 does not include a recommendation for the total cesarean rate due to varying patient factors, it recommends that efforts be made to decrease the primary cesarean rate to 15% in women who are giving birth for the first time 6. ACOG similarly recommends that comparative cesarean delivery rates for populations, hospitals, or physicians should be based on the subgroup of nulliparous women with term singleton vertex gestations 7. We would be interested in seeing the rate for this population at those affected facilities in Oklahoma Area. We worked in at the Gallup Indian Medical Center (GIMC) and Zuni-Ramah Hospitals in the 1990s and continue to work with Native populations in Albuquerque and New Mexico. Our study of the population based CS rate in Zuni-Ramah in the 1990s demonstrated a 7.3% cesarean rate despite an incidence of diabetes and hypertensive disorders well above national rates 8. Physician specific practices influence cesarean delivery rates 9. We believe that the cesarean delivery review initiated at GIMC in the early 1990s was important in identifying factors in patient management that can result in a high cesarean rate. An important ingredient in reducing cesarean delivery, either in nulliparous or parous women, is to place value on vaginal delivery. The attitude that “None of the physicians in our department are concerned with our cesarean delivery rate” may prove the largest stumbling block in developing strategies more consistent with national goals. We suggest that the maternity care providers in Hastings present the evidence for improved maternal outcomes in women with prior vaginal delivery to their anesthesia colleagues and make TOLAC available at least for this group of women. Addressing the high total (and presumably) primary cesarean rates will require analysis of the indications and physician specific patterns. Given the increasing evidence for adverse outcomes with multiple repeat cesareans and the limited ability of community hospitals to address problems with placenta accreta, increta and percreta, we support labor management strategies to reduce cesarean rates in the Native American population in the Oklahoma Area and nationwide. First, I want to thank the leaders of the Indian Health Midwives listserv for raising these important issues, as this discussion was originally begun in the Midwives Corner feature. Though the current discussion revolves around Indian Health facilities, it is reflective of most small rural hospitals and increasingly some larger urban facilities. Next, the availability of the trial of labor after cesarean option is really a ‘systems’ issue not just a problem confined to midwives or physicians. To decrease the long term morbidity and mortality associated with cesarean rates that now exceed 40%, we need to approach this issue systematically. Specifically, how can we engage our Indian Health administrative staff to foster an environment whereby anesthesia, pediatric, and nursing services work together with the provider staff to decrease excess morbidity in Native women. Should you offer vaginal birth after cesarean delivery at your facility? Should your referral facility be offering VBAC? Let’s put some of the above issues into perspective. In all but one of the above cases the incidence of these obstetric emergencies is actually increasing each year. If you work at a facility that can not develop a rapid response for a clinical issue like symptomatic uterine rupture in a VBAC setting, which happens ~0.5 percent of the time, then your facility, should re-evaluate its ability to manage obstetric intrapartum care. Taken on their own individual merit, most of the above common urgencies and emergencies occur more frequently than 0.5 percent. Taken as an aggregate, the risks above far outweigh the risks of VBAC. Now seeing the above risks, if you feel you need to re-evaluate offering obstetric intrapartum care because the above risks, then please contact me as soon as possible. For those facilities that feel they are able to continue to offer obstetric intrapartum care within the risk environment above, then I would suggest a program of emergency obstetric drills, pan-ALSO** certification for all nurses and providers, and an ongoing quality assurance. Lastly, there seems to be some confusion as some providers at times combine the risk of a TOLAC sequela vs the relative success of a vaginal birth in TOLAC. These are two separate issues that need to be discussed with our patients separately for a fully informed consent. Overall the rate of successful vaginal delivery in TOLAC is actually quite high, often in the range of 75% in the general population, and much higher success rate in the AI/AN population at 85-90% over the years. A previous successful VBAC is probably the best predictor of future success; about 90 percent of such women deliver vaginally with trial of labor. By comparison, women delivered abdominally for dystocia are least successful, although approximately two-thirds are delivered vaginally. Multivariate logistic regression analysis identified as predictive of TOL success: previous vaginal delivery (OR 3.9; 95% CI 3.6-4.3), previous indication not being dystocia (CPD/FTP) (OR 1.7; 95% CI 1.5-1.8), spontaneous labor (OR 1.6; 95% CI 1.5-1.8), birth weight <4000 g (OR 2.0; 95% CI 1.8-2.3), and Caucasian race (OR 1.8, 95% CI 1.6-1.9) (all P < .001). The combination of previous cesarean for dystocia, no previous vaginal delivery, and induced labor had a particularly poor prognosis in the Flamm system, e. g., fewer than 50 percent of such women achieved a successful TOL. All overall P values are <.001; for categorical characteristics, only the comparison of birth weight <2500 g to 2500 to 3999 is not significant (P=.33). CI: confidence interval; CD: cesarean delivery; VBAC: vaginal birth after CD; NRFWB: nonreassuring fetal well-being. * Women with this characteristic served as the reference group. Modified from: Landon, MB, Leindecker, S, Spong, CY, et al. Am J Obstet Gynecol 2005; 193:1016. Data from: Flamm, BL, Geiger, AM. Obstet Gynecol 1997; 90:907. 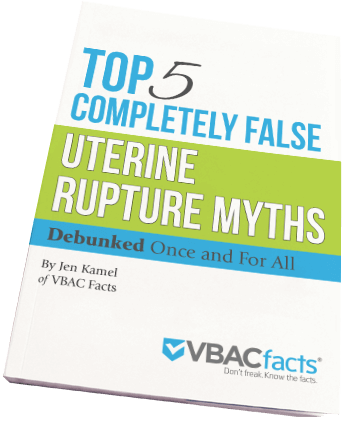 Numerous risk factors have been cited for uterine rupture during labor in women with a previous CD. However, these risk factors are not consistent across studies, which are generally hampered by small numbers of patients with uterine rupture. Unfortunately, no single factor or combination of risk factors is sufficiently reliable to be clinically useful for prediction of uterine rupture. Purported risk factors include maternal age greater than 30 years, induction of labor, more than one prior CD, postpartum fever, interdelivery interval less than 18 to 24 months, dysfunctional labor, and one layer uterine closure. Within this framework of incomplete data the New England Perinatal Quality Improvement Network (NNEPQIN) has developed a system to appropriately manage the risks. Patients with a prior successful VBAC are especially low risk. * NB: ‘Two prior uterine scars and no vaginal deliveries’ is listed as a circumstance under which trial of labor should not be attempted by the American College of Obstetricians and Gynecologists ACOG Practice Bulletin No. 54, ‘Vaginal birth after previous cesarean delivery’. Vaginal birth after cesarean (VBAC) in rural hospitals Counterpoint: David Gahn, M.D. 1 Cahill AG, Stamilio DM, ADibo AO, Pelpert JF, et al. Is vaginal birth after cesarean (VBAC) or elective repeat cesarean safer in women with a prior vaginal delivery? Am J Obstet Gynecol 2006; 195:1143-7. 2 Hamilton BE, Martin JA, Ventura SJ. Births: Preliminary data for 2006. National vital statistics reports; vol 56 no 7. Hyattsville, MD: National Center for Health Statistics. 2007. 3 Kennare R, Tucker G, Heard A, Chan A. Risks of adverse outcomes in the next birth after a first cesarean delivery. Obstet Gynecol 2007; 109:270-6. 4 Silver RM, Landon MB, Rouse DJ, Leveno KJ, Spong CY, Thom EA, et al. Maternal morbidity associated with multiple repeat cesarean deliveries. Obstet Gynecol 2006;107:1226–32. 5 Getahun D, Oyelese Y, Salihu HM, Ananth CV. Previous cesarean delivery and risks of placenta previa and placental abruption. Obstet Gynecol 2006;107:771–8. 6 U.S. Department of Health and Human Services. Healthy People 2010. 2nd ed. With Understanding and Improving Health and Objectives for Improving Health. 2 vols. Washington, DC: U.S. Government Printing Office, November 2000. 7 American College of Obstetricians and Gynecologists, Task Force on Cesarean Delivery Rates. Evaluation of cesarean delivery. Washington, DC: American College of Obstetricians and Gynecologists, 2000. 8 Leeman L, Leeman R. A Native American community with 7% cesarean delivery rate: Case mix analysis, risk factors and operative indications. Ann Fam Med. 2003;1:36-43. Cahill AG, Stamilio DM, ADibo AO, Pelpert JF, et al. Is vaginal birth after cesarean (VBAC) or elective repeat cesarean safer in women with a prior vaginal delivery? Am J Obstet Gynecol 2006; 195:1143-7. I have a 1 year old daughter who was delivered via cesarean because of my Arnold Chiari malformation Type I that I was diagnosed with coicidentally. I have been totally asymptomatic my whole life and it was only found coincidentally. My midwife consulted the obstetrician she practices with about my condition when I was just 8 weeks gestation and he insisted on a C-S even after the perinatologist he sent me to for consultation claimed a C-S was unnecessary for this. I delivered without any complications and my daughter did wonderfully. However, after I returned to work, the obstetricians that I work with (I am a neonatal nurse) explained to me that they would have never performed the C-S either. I didn’t deliver at the same hospital I work at. One doctor told me that he just delivered a patient with Type II Chiari and he had sent her to Johns-Hopkins for an eval. and they gave the go ahead for a vaginal delivery. I am very upset to this day because I feel that it was totally unnecessary and was done because this doctor did not take the time to research my condition. I am hopeful for a VBAC next time and I have found a practice that is willing to give me a TOL. I am hoping to conceive sometime this spring and I hope it will be a success if I get to try!!! Your website has been very helpful and very informative on the subject. Thank you!!! !